Some 30 years ago or so I happened to be at Hohner's in Trossingen and purchased there a Pro Harp in so called "Spanish tuning". Nobody could tell me how to play it. And after the one or the other try I failed to find out how to play something pleasant on it. The harp went into the darkest part of any drawer and got forgotten there. At once I remembered my old harp. After some rummaging through some dusty drawers I found it, patiently waiting there in its little box for getting kissed awake after decades. And since I tried to play what this guy did, I found out, that this tuning is very suitable for flamenco, tango (already tried), and most probably texmex, fado, choro and other latin stuff as well, especially when grave and solemn. 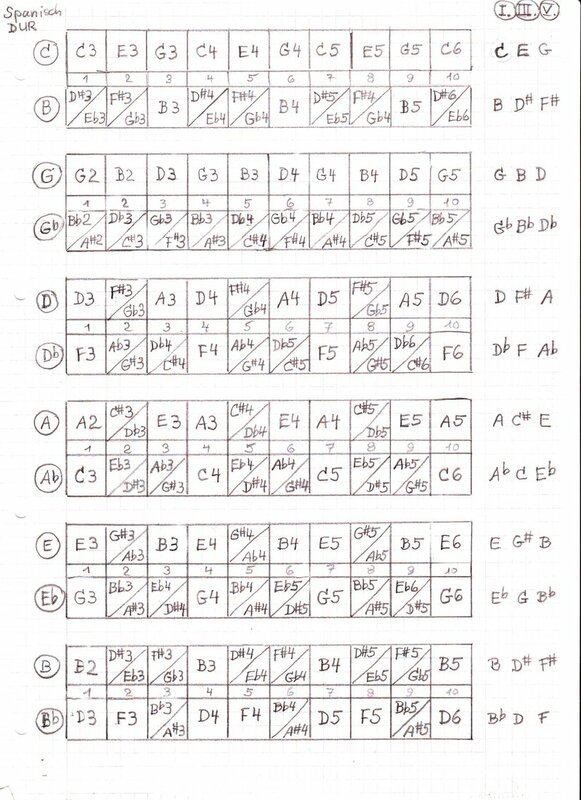 All draws contain only notes of the E major chord, all blows contain only notes of the F major chord. Specially when playing chord orientated and polyphonic (by tonge block) there might occure quite long passages containing only draw tones and chords, in turns with long passages containing only blow tones and chords. This needs getting used to. And it is clearly different from Richter tuning or anything similar. But as long as the tuning fits best for solemn styles this is not as hard to manage. It just needs to aquire an appropriate pattern of breathing. To my opinion the tuning is appropriate best to draw orientated styles and patterns. So far so good. Actually there are more than only the keys of E and F in these styles. Richter, Paddy, Melody Maker, Circular and other tuning systems allow to transpose a pattern of layout throug all the keys in the same way. Is the method of transposing a layout in other keys also valid for any other kind of tuning? If I have a harp in a certain tuning, which is nice to play, and I want to have it in other keys, do I just have to switch / transpose the layout of my existing harp analogously throughout the circle of fifths? Now I would like to know if my considerations are correct, before I order the one or the other configurated harp in other keys. Maybe some of the "tuning nerds" can have a look on my layout tabs. Thank you. Be free to copy the tabs for your own use, if you like. I've never tried the Spanish tuned harmonica, but looking at your questions, I can confirm that your first 2 question could be answered by "Yes" in both cases. 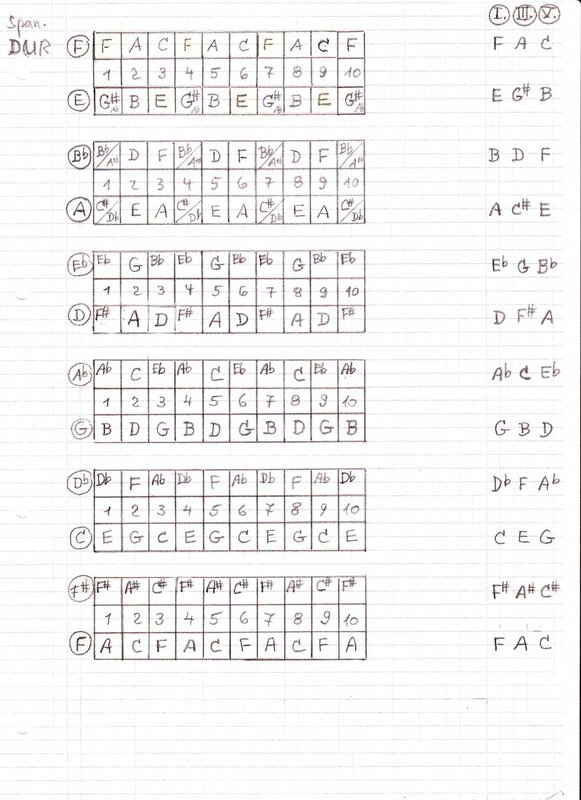 The diagrams below seem to be all correct, only that "B" and "Bb" are confused in one place (A/Bb tuning), which I suppose is due to the difference in German standard notation (AHC) compared to the English/Dutch notation (ABC), where German B is English Bb. (And English B is German H). I didn't go through all the tunings thoroughly, but they seem to be correct in my eyes. Interestingly, the combination of (in this example) E/F is very common in the key of [a minor], where the aeolean fifth and sixth chords in this key would be [e minor] and [F major], respectively. However, the fifth in [a minor] key, very commonly is replaced with a major chord with the same root, that is the [e minor] becomes [E major]. This happens in all kinds of music, but is particulary common in e.g. flamenco. A tune I like to play and sing is the Venezuelan "Caballo viejo" by Simón Díaz, where this chord change is used extensively. It is not a flamenco, but rather a "llanero", and has been rearranged to be played as rumba, cumbia, etc., by various artists. Part of it also appears in the medley "Bamboleo" by The Gypsy Kings. thank you for the answer. Just as I presumed. I have already played with it flamenco and several kinds of tango and stuff like Ravel's Bolero. Concerning flamenco, this seems to be a very typical sound pattern to my ears. And I presumed by feeling, that there were quite a number of other latin styles where it were suitable - just as you wrote too. (Thanks for the examples. I will study them.) And therefore I thought that it would make sense to try this tuning in other keys too. Next week I will hear a concert of a friend of mine (a guitar virtuoso), who plays a lot of flamenco, salsa, Cuban and other latin styles and gypsy. I will show him the harp and play it some bars to him, and I will ask him, what keys / combination of keys are common as well in these styles. Last edited by triona on Wed Jun 13, 2018 1:46 pm, edited 1 time in total. That's great to hear, Triona! Hope to hear about what your guitarist friend has to say about the Spanish tuning and its possible uses in different music traditions! E - F - G# - A - B - C - D.
A - B - C - D - E - F - G#. The missing D wouldn't be too hard to reach, a draw bend on hole 3, 6 or 9. Two semi-tones down, out of three, so you'd have to be precise, though. This tuning lends itself to lots of nice bending, an essential part of any good harmonica tuning I think. Would love to hear you playing it Triona, if you fancy posting a music clip sometime. thank you very much for the info about the scale on which this tuning is based to. This was a question I had asked me too some times. Just I had forgotten to write it in my first post. That it must have to be any minor could I easily hear. But which one of the many? And that there were only six notesand no core octave confused me too. Voilá. Nothing new at all. Rather that old, that it's been nearly forgotten. And the old gypsies and sephardim in late medieval Spain had no fuzzing about playing it on a harmonica. And your analysis of the scale and its available notes is corespondenting clearly with your analysis of the chords and their variances (alteration? modification? modulation?) in your first post, where you assumed from what you had already heard in several styles. As soon as I have one I will share it here of course. My problem is that I lack proper device for recording. I have played it in public one time some weeks ago in Berlin. All listeners liked it. And they all were harmonica players. And they wondered about the style - it was a kind of a flamenco improvisation, not often heared on a diatonic harp. This tuning lends itself to lots of nice bending, an essential part of any good harmonica tuning I think. Indeed, all twelve semi-tones per octave are available as either regular blows or draws (6/octave) or as draw-bends (6/octave), and with a consistent pattern through the 3 octaves! As I took out the harp for a try one more time, I had a special look on this. And I found out, that I always have bended this note intuitively in the past, when I missed a special note in a tune or in a rhythm pattern. This is the practical proof of your theoretical workout. And thanks for the link with the sources of scales. The keyboard graphics are easier to read for me than full notation or usual tab notation with only letters. The black and the white keys indicate and visualize clearly where there is a halftone or a wholetone step within any scale. Using a keyboard for a help it is even to make audible easily. (I can not play or sing at sight.) This helps to learn musical theory very much.